The rather spectacular rally in equity prices since Mar. '09 continues. As we close in on the pre-recession highs in the stock market, I think it's important to stress once again that one of the major causes of the economic and financial crash of 2008-09 was fear: fear of deflation, of depression, of a collapse of the global banking system, of massive corporate bankruptcies, of a housing market meltdown, of a future with staggeringly high tax burdens, and of a significant increase in the size and burden of government. Both the Vix index and swap spreads soared in late 2008 as fear mounted. The rally has been propelled by the diminishing likelihood that these fears will be realized. It has also been driven by Fed policy which keeps short-term interest rates near zero. When the interest rate on cash and cash-subsititutes is essentially zero, then one can reasonably refrain from purchasing riskier and higher-return assets only if one is convinced that the worst fears of the market are going to be realized. When it turns out instead that the economy improves and the potential for catastrophe recedes on almost a daily basis, equity prices have nowhere to go but up. Moreover, for the past several months the potential for very constructive change in fiscal policy has improved significantly. The first part of the rally was thus driven by a decline in catastrophe risk, and now the second part is being driven by the rebirth of optimism. There are lots of reasons to be optimistic today, yet key prices (e.g., PE ratios, credit spreads, implied volatility, Treasury yields) have yet to reflect any sign of optimism regarding the outlook for growth and prosperity. For the last ten to twelve years equities have not been the preferred asset class for most investors. For two or three of those years it may have been near the top, but in my opinion something else had always been ahead of it. Real Estate, gold and other precious and semi precious metals, bonds..especially treasury and high grade corporates, and municipal bonds..particularly among high net worth investors, and even CDs and money market funds, all rotated into the 'most favored' catagory. Equities always seemed to be in the mix but down the list of where 'in-the-know' savvy investors were putting their money. Today, real estate has busted, gold is still popular but its been on a multi-year run and appreciation is lagging, the bull market in bonds is being killed by the Fed's ZIRP and POMO policies so there is no longer any hot action there. The fear merchants are now targeting muni bonds slinging around the one word most frightening to a tax free bond buyer...'DEFAULT'. CDs and MM funds yield nothing. That leaves equities. The media is trumpting that the S&P 500 has doubled since the March '09 lows and anyone who has bought and held good quality stocks even as late as last month likely has profits. It is very possible that equities are shedding the stigma of being the red headed stepchild of the investment world for the first time in over a decade. If that is true, then we are still early in this move and it is not too late to participate. Pullbacks/corrections will occur. We had a doozy last summer. 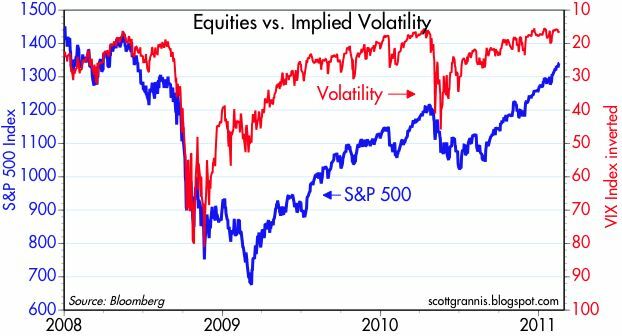 It may happen again because volatility comes with the territory. If you can't take some pain, stay in the bank. But bull markets can last for several years and we are only two years into this one. Incidently, in my opinion Scott's alltime best post occured last summer in late August, seventeen weeks into the 17% correction that began in May with the Euro collapse scare. "TWENTY BULLISH CHARTS" laid out the case for the bull market to continue. Within days the market began the rally that continues to this day, nearly six months later. Its in the archives. Go back and read it. It was a fantastic post. Gold is gold. All gold looks the same. It either goes up, down, or sideways. Interest rates on Treasury bills and bonds either go up, down, or sideways. But, individual stocks are so much different than bonds or gold. And plenty of shares of many individual company have done extremely well over the last 10 years, even if the indices seem to be flat. If you look at the longer time frame, this fact about individual stocks stands out even more so. I agree with Scott Grannis' sentiments almost exactly in this post. The market is not overvalued, and investors are gaining confidence. I see a long, long rally ahead, globally.